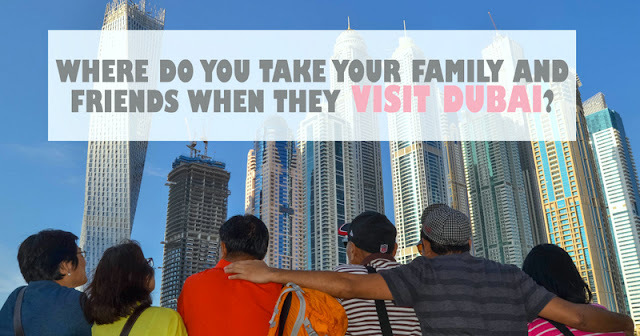 Home » Dubai , Dubai Bloggers , Filipino Blogger in Dubai , Filipino Instagrammers in Dubai , Lady Asks , UAE Bloggers , UAE-Dubai , Where to go in Dubai » #LadyAsks: Where do you take your family and friends when they visit Dubai? #LadyAsks: Where do you take your family and friends when they visit Dubai? Living in Dubai for 10 years, Ed and I feel ecstatic whenever a family member or a friend decides to visit us. We take them to our favorite spots, to some are hidden gems, and to the city's world-famous structures! We want them to have the experience to remember! And although it's subjective, we always hope that they would love Dubai as much as we do. Ed and I do love to play tour guides to our visiting loved ones. But given that Dubai is a fast growing city (There's always a new place to visit! ), we wouldn't consider ourselves as experts. Oftentimes, we crowdsource, read blogs, and search on Instagram. "Where do you take your family and friends when they visit?" For family members and friends who visit Dubai for the first time, I usually suggest for them to never miss to experience one of the most distinctively fun Dubai tourist-activities, the Dubai Desert Safari! Dune bashing on a land cruiser, camel ride while watching the sunset, going to a desert camp where they can enjoy unlimited beverages and wear traditional Emirati attires; eat BBQ buffet that includes chicken shawarma, watch belly dancing, fire, and tanura shows; these define a fraction of what Dubai is all about! One of my favorite places in Dubai is Bastakiya, one of the earliest heritage sites in the city. Also known as the Al Fahidi Historical Neighbourhood, this reminiscent place in Bur Dubai offers its guests a glimpse of Old Dubai (you’ll even find a piece of the city’s oldest wall here). Traverse through its maze-like pathways and tranquil courtyards, as you explore this traditional and beautiful district. You should definitely visit their museums (the Coffee Museum is highly recommended), art galleries, ateliers and cultural centers. The best part of all, it will cost you nothing to explore this area, as most establishments have no entrance fees. To give family and friends an authentic taste of Dubai life I would look no further than Bastakiya. This beautiful district's narrow alleys are packed full of heritage architecture, cool cafes (you must visit the Arabian Tea House) and art galleries featuring local inspired art. The highlight of this area has to be the Sheikh Mohammed Centre for Cultural Understanding (SMCCU) where you can share an authentic local meal with warm, passionate Emirati nationals who will tell you all about their culture and take you on a tour of the local mosque. An affordable, picturesque, unmissable trip! My favorite is At The Top. Although we’ve been there only once, it is one of my favorite places here in Dubai. For me, the best time is at sunrise where you get to see Dubai while it’s dark and witness it awaken come sunrise. If only I can visit every day. To watch the whole city come alive from the tallest structure in the world is a great experience and seeing it with my family is what makes it all the more special. Definitely a must visit. A hot air balloon flight over the Arabian desert is one of my recommendations when you visit Dubai. It is a one of a kind experience and it will give you a chance to witness the sunrise. The hot air balloon flight is a unique experience in appreciating the beauty of the Arabian desert. If sophistication and luxury are what you’re after, head on to one of the world’s most luxurious hotels with an underwater restaurant, gold leaf interiors and suites overlooking the sea. Dine in one of their restaurants and experience the life of the rich and famous. It’s not as expensive as you think; believe me, I was there. It would be The Beach for me! Going to beaches in the Philippines is tedious, not to mention pricey, especially if you live in the mountains like I do. Glad that Dubai beaches are just a 10-15 minute ride away. I love it at The Beach as it’s less crowded and there are a lot of food options too. Plus, where else can you see a camel basking under the sun while enjoying the sea breeze? When in Dubai never miss to visit and get up-close with flamingos while they bask the warm ambiance of the city. Entrance is free all year round 6 days a week except on Fridays, 9AM-4PM, but the best time to visit the place is between December to March during the winter season. A binocular is provided to see the birds the closest way possible. Lastly, view #BurjKhalifa in a different perspective, like how I let my sister @derpingmuimui experienced BK the unconventional way. She didn't get the chance to visit Dubai Mall. A subtle way of telling her that she should be back. The Waterfront Market is suitable for family and friends because it is a place where you can bond in a different way: shopping fresh produce. They have a really nice seaside! Super win-win situation for those who want to stroll by the sea, eat by the sea, at shop by the sea at a very affordable price. I recommend bringing friends and family to Hub Zero in Citywalk. It is a state-of-the-art indoor gaming zone that includes virtual reality games as well as thrilling rides and attractions. I personally like the shooter games like the Virtual Arena and Hack Attack, as well as wall climbing adventure in the Hero Vertical Adventure Zone. Al Seef, a new project under Meraas, is one of the newest spots in Dubai with a tagline ‘where heritage meets urbanism’. Here, you will be able to trace the footsteps of the fishermen, tradesmen, and weavers from the past. Enjoy a relaxing time wandering the marina or indulge at the restaurants and cafes inspired by the cuisines around the world. If you’re looking for a place where to calm your heart with the sound of the waves, longing for the touch of the sands or just want to have a sweet escape from the busy central, go shop and dine, The Walk JBR is one of the places to hit when you’re in Dubai! You can definitely enjoy the beach without leaving the city life and much of what it could offer to satisfy your lifestyle cravings. Have a stroll and enjoy activities in different spots including the instagrammable street arts attraction and camel ride or just take the pleasure of outdoor shopping experience and fine dining. Turn on: Souk Madinat Jumeirah offers the "halfway spot" to experience the old and new Dubai. Without spending a single penny, tourists can begin immersing into the culture via the traditional Arabic facade highlighted by the wind towers, the palm trees, the abra ride at the lagoon with the elegance of Burj Al Arab in the background. The souk offers a mix of traditional arts and modern shops and eateries. Watch out for the craftsman who does his bottled sand art with creativity and finesse. Turn off: Eateries are costly. La Mer is one of the trendiest places in Dubai right now. A new place that people should see! This new development overlooking the sea is just really amazing! Not only you can dine at some of your favorite restaurants, La Mer has play areas for the kids, open beach, water sports, and activities. An all in one place perfect for a family or even for your squad get away. Old Dubai, the heart and soul of Dubai. A preserved place in the heart of the modernized land of Dubai where you can find the old culture, the vintage vibes and the feeling that tall buildings can't give to you. Such a perfect place for an amazing historical adventure. One of the must-see attractions for the family to enjoy when visiting Dubai is to watch the Dubai (dancing) Fountain. Located in between two of Dubai’s famous landmarks, the Dubai Mall and the Burj Khalifa, you will unlikely to miss a show. Dancing (at some point even flying) to a wide library of tunes from pop, classical to even traditional music, this show is not only for children but definitely will be enjoyed by adults. Best of all, this attraction is free. Whew! Awesome answers from my blogger beshies, right? I love taking my guests on a journey in Dubai's bizarre palm-shaped island! The Palm Monorail takes us from the island's trunk to the tip of the crescent where Atlantis The Palm is located. For the thrill seekers, I recommend riding a seaplane or skydiving (just like what Ed did) to see the unique island from a different perspective. Massive thanks to my blogger friends for participating in our first ever #LadyAsks article! My curious mind will surely ask more questions soon, so stay with me on Facebook and Instagram! If you love to help me with an answer (whether you're a blogger or not), feel free to send me a message.